I first heard about this book when I was tooling around on Goodreads. Several people I follow posted excellent reviews of Angelfall (reviewers I consider pretty tough so when they speak highly of a book, I take notice. ), and although I'm not much of an ebook reader, I decided to check it out, especially when I saw that Amazon had it listed for 99 cents. I figured, what's the worst that could happen? I spend a dollar on something I don't like? Big whup. Well, it turns out, it was money well spent. There's a lot of bang for your buck here. Blurb: It's been six weeks since angels of the apocalypse descended to demolish the modern world. Street gangs rule the day while fear and superstition rule the night. When warrior angels fly away with a helpless little girl, her seventeen-year-old sister Penryn will do anything to get her back. It's not that Angelfall is perfect; it has its flaws, but I was totally engrossed by the story. Vividly drawn, this post-apocalyptic novel is set in a world were society has rapidly devolved after angels go to war against humanity. Danger is everywhere. If the angels don't get you, the human gangs will. Not to mention that there is some sort of carnivorous pack of somethings roaming the night. No place is safe. We first meet our heroine, Penryn, as she endeavors to escape the city with her mom and her wheelchair-bound sister. Before they can get very far, they stumble into an angel-on-angel beatdown which results in the abduction of Penryn's sister. 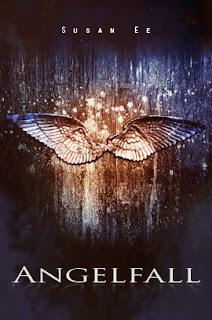 Penryn must team up with Raffe, a wingless, wounded angel, in order to find and rescue her little sister. I loved Penryn. She is strong; resourceful; pragmatic; and she doesn't spend time dithering about. She doesn't wait to be saved but takes matters into her own hands. When there's a problem, she does her best to solve it, never faltering from what she sees as her responsibility. She may be desperate but she is also a survivor. Only seventeen years old, she has assumed responsibility for the care and well-being of her family. And she is strong enough to not only take care of herself but to protect her own. The world building is evocatively creepy and the author has a fascinating take on the mythology of angels. (Righteous angels, Murderous angels, Deviant angels, and even - wha?! - Agnostic angels! STFU! Gimme more!) My only quibble is that society seems to have gone to hell and a hand basket awfully quick; it's only been six weeks since the angels went on their murderous rampage. But, I was too deeply immersed in the tale to let that bother me much. Ee brings this story to riveting life. The pacing is edge-of-your-seat great and I stayed up way too late because I couldn't put it down. Despite the swift pace, the characters' relationships with one another never felt rushed. Penryn and Raffe's relationship is allowed to deepen naturally, with neither forgetting that they are essentially enemies forced to work together in the short term. The author also gives us some finely drawn secondary characters that I really cared about. You know how in some books, the tough hero has a loose cannon of a friend who intermittently appears in order to either help or hinder the hero? (Y'know like Mouse from the Easy Rawlins series). Well, in this book that character is Penryn's mom and she is fierce. Mom is a paranoid schizophrenic who sees danger everywhere. But just 'cause she's ill, doesn't mean she is wrong. Like Penryn, she is a fighter and a force to be reckoned with. There is a great family dynamic here. It's kind of amazing how strong of a book this is. Ee self-published it but managed to avoid some of the more common pitfalls found in self-published work. The quality is topnotch. If I could, I would buy and devour the next book in this projected five book series but it hasn't been written yet. It should be out this summer and I await it eagerly. Angelfall is also supposed to come out in print although I haven't been able to find out exactly when or who the publisher is. I'm going to buy it when it does. I'd like to have a hard copy of this one. I know. I tried to find out when the second book would be out when I was at BEA but they weren't able to tell me anything. I did end buying a hard copy, tho. This is one of my favorite reads this year.